Yogurt is hung to make it thick. Fresh pineapple is peeled and very finely chopped. It is then mixed with hung yogurt along with sugar and nuts. 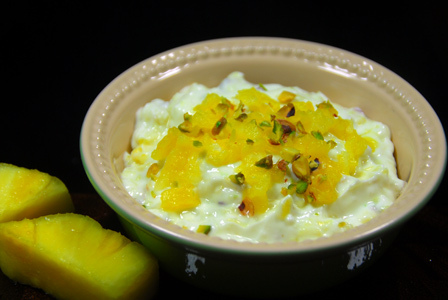 Serve pineapple shrikand immediately. 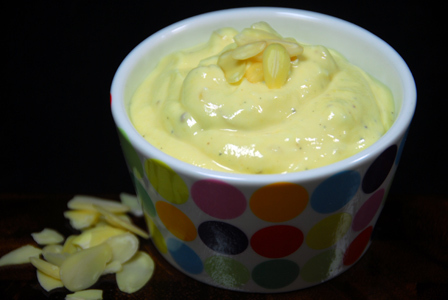 Makes: around 4 Servings of Pineapple Shrikhand . Peel and very finely chop the pineapple. Then stir in chopped pineapple, cardamom powder and sliced pistachios. Garnish with chopped pineapple, pistachios and serve pineapple shrikand immediately. Notes: You can also use canned pineapple. Adjust sugar accordingly if the canned pineapple is sweetened. Variations: You can also add honey instead of sugar if you wish. 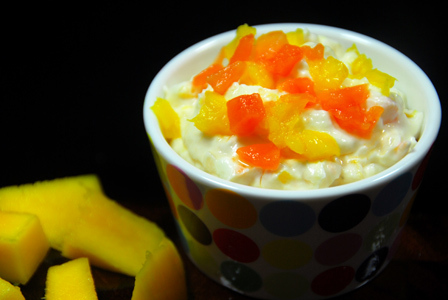 Few tablespoons of pineapple juice can also be added if the hung yogurt is too thick. White sesame seeds are lightly toasted and ground into fine powder along with almonds and jaggery. The mixture is then formed into small laddoo. 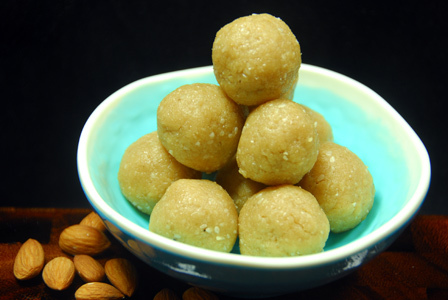 Serve sesame almond laddu as required and it stays fresh for a couple of weeks. 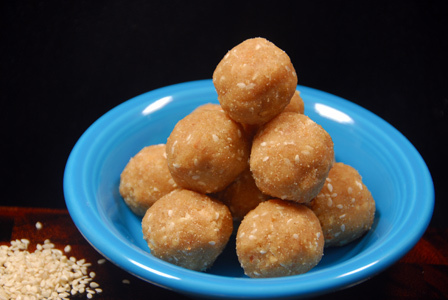 Makes: around 7 Sesame Almond Laddu. Soak almonds in water and microwave for a minute. Peel the skin and let the almonds dry. Roughly chop the almonds and keep aside. Grind almonds into fine powder using a grinder. Then add the sesame seeds and grind again into powder. Finally add the sufficient grated jaggery and grind well. Store the formed sesame almond laddu in a jar and they stay fresh for couple of weeks. Serve sesame almond laddu as necessary. Suggestions: Adjust jaggery according to your preference. Choose somewhat soft jaggery if possible to ease the laddu making. If you have hard jaggery, you can melt with few tsps of water into syrup before adding the ground sesame almond powder. Other Names: Sesame Almond Laddu, Nuvvulu Badam Pappu Laddulu.